It’s been a couple of days since the appearance of that viral Go-Jek ride video, and the internet has not been able to let the buzz die. Dozens of memes — including some by the Singapore Civil Defence Force, Caltex and more — have emerged from the seven-minute video that depicted a highly hysterical dispute between a Go-Jek driver and his dramatic passenger who genuinely believed that she was being held hostage. Now, the man himself has added a new dimension to the now-legendary clip. 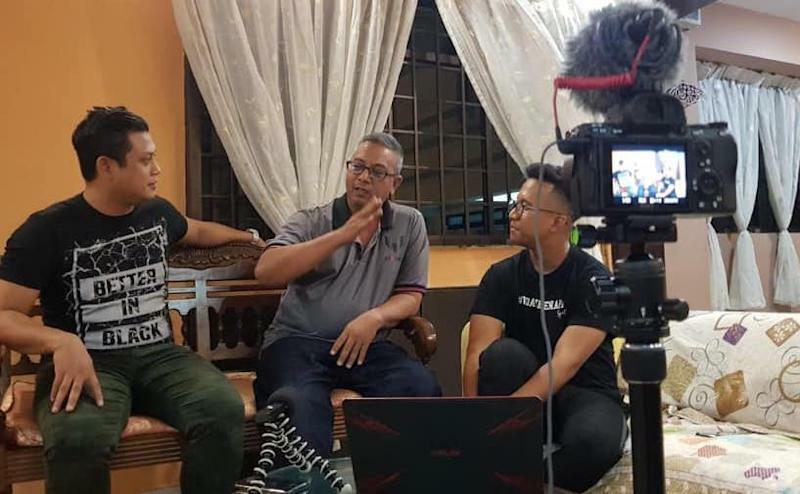 Go-Jek driver Kamaruzzaman Abdul Latiff invited RIA 89.7FM radio host Dzar Ismail to his home to provide a running commentary of the video he recorded that fateful morning. The 49-year-old driver — now cleared and declared faultless by Go-Jek — has been overwhelmed by his newfound fame, he tells the radio hosts. In the commentary, the man tells all about his experience in the aftermath of the viral clip while providing insights into what ran through his head during the actual journey with the difficult passenger. Reportedly, the lady has already taken down her Facebook page and flew overseas for a holiday. Watch the video below, and scroll further down for translations of what Kamaruzzaman said. 0:27 – I received over 770 friend requests on Facebook. I can’t take it anymore; I want to turn off everything. An hour after I posted the video, my phone couldn’t stop buzzing. 1:24 – I started recording our argument because she had already started accusing me of kidnapping her. 2:28 – I had no idea who she was calling, but I heard that she called her mother. 2:38 – I was taking her to a police station because she agreed. You can hear her asking me to bring her to Tanglin Police Station. I told her that it’s too far, and might as well I bring her to The Adelphi (her intended destination at Coleman Street). 4:11 – Yeah, this is a (Certis Cisco) officer — I was at the guard post. I made a mistake by thinking it was a police station. 4:37 – (In response to Dzar’s question about how the Cisco officer reacted) He was neutral because he didn’t know what really happened, but he had to get involved when the girl started causing a commotion. 6:45 – At the moment after she said (“is it because I’m Chinese?”), I had to stop filming. I didn’t have the intention to record and shame her. 7:06 – (In response to Dzar’s question if he felt glad that he recorded the incident as evidence) Partially. More relieved that I released this video so everyone knows what could happen to them if they’re not careful. 7:19 – Because of the non-stop calls and notifications, I’ve haven’t been able to sleep much. 7:35 – This is the first time I’ve faced this kind of experience — have never had this issue when I worked for Uber and Grab. I’ve had typical quarrels with passengers about (Electronic Road Pricing tolls), but this girl was different. She used the word “hostage” and “kidnapping”. I started recording because she used those words. 8:26 – (In a message to ride-hailing service customers) You have to be reasonable — when us Go-Jek drivers cancel a trip, we have to take up another five trips just to recover quota required to receive the job incentives. 9:13 – (In a message for ride-hailing service drivers) You have to be more patient, you have to make some new friends, you have to avoid all these… nonsense. The most support I got is from my family… they do make fun of me though. This article, Go-Jek driver in viral ‘hostage’ clip offers running commentary and new insights into the video, originally appeared on Coconuts, Asia's leading alternative media company. Want more Coconuts? Sign up for our newsletters!